Yesterday I wished I was a food blogger and today, I am. And what qualifies me? The fact that I made this bread today, took a picture of it, and posted it. Presto! I’m a food blog. But just for today. The odds of my taking pictures of my meals everyday are pretty slim. But, despite my hesitancy about food blogging, today is not my first time to cook for others in public. Many years ago, in a lifetime far far away, I trained (ever so briefly) to be a chef. I was still in college and debating between two careers: writer or chef. For most, this would be a delayed decision. One would normally major in English, learn to write, graduate, and get a job writing. Or, one would skip college and go straight to a culinary arts school. But, I didn’t attend a “normal” college. I went to Antioch College, a liberal arts college in Ohio that requires each student to do “work” quarters in addition to “study” quarters. It was basically a mandatory internship program which we all did. This meant I could explore two careers at the same time without committing to just one. Some, like my friend Eileen (Hi Eileen!!) paged at the Library of Congress, others interned at law firms. You know, smart jobs. What did I do? I cooked in restaurants. This may seem glamorous now, what with Iron Chef and America’s Test Kitchen, but in the early 80’s nobody thought I was a genius to apprentice in a two and half star restaurant in Princeton, New Jersey. At the time, I wasn’t so sure about it either. I was a pastry assistant and prep cook. What does this mean? It means I did all the prep for the pastry chef. I made pie doughs, ice creams, butter cream, custard sauces, and when he would let me, cakes. I arrived at 1 PM and left at 11 pm and I worked six days a week. If I was a food blogger, I would probably write lyrical descriptions of silky smooth custard sauces that I lovingly tended. I might write about learning to melt chocolate for truffles or my first time using an electric ice cream maker. I would not tell you about standing in line at the grocery store to buy lettuce for that night’s dinner service. I would probably not tell you about getting yelled at each night by the chef because I rarely washed that lettuce to her satisfaction. And I probably wouldn’t mention the night the cops came to the back door to arrest one of the waiters. If I was a food blogger, I would have sweeter descriptions and more pictures. “How did it come out?” Brian asked as he came up behind me. It looked about the same, but we ate it anyway. I forgot to add raisins the night before so Brian sprinkled a handful on his bowl before he ate it. It tasted better than it looked. But the other problem was that I had 8 servings of oatmeal. I forgot to cut the measurements in half since there are only two of us. 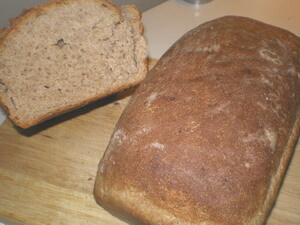 So, this evening, instead of throwing it away, I made oatmeal bread out of 2 cups of congealed oatmeal. It bakes up better as bread. So, now that I’ve sold you on the oatmeal, here’s the recipe for the bread. I improvised this recipe so don’t ask for a reference to a cookbook or a food blog. This one is all mine. ‘Cause remember, I’m a food blogger. Step 1. Soften the yeast in the water and add the honey. Wait 10-15 minutes until the yeast is foamy. Step 2. Add the slightly warm oatmeal and mix. Step 3. Add the salt and butter to all the flour and mix in the butter with your hands until the butter is the size of small peas. Step 4. Add the oatmeal mixture to the flour and mix until the flour absorbs the moisture. If it appears to dry, add a few drops of water. If too wet, add more flour. Step 5. Knead the bread until it is elastic. Step 6. Let it rise for 1 1/2 hours in an oiled bowl. Step 8. Preheat oven to 450 degrees. Step 9. Once loaves have risen, bake in 450 degree oven for 10 minutes, then turn down the heat to 350 and let it bake another 30 minutes or so. Depending on how hot your oven runs, you make need more or less time. Step 10. When you pull them out of the oven, the loaves should be brown. To check for doneness, flip one out of the pan and tap it on the bottom. It should sound hollow. Today, I used a trick from a food blogger. I used an instant read thermometer. If it reads 190, it should be done. My loaves came in at 200 degrees. Whew! That was a lot of work. This is explains why I’m not a food blogger. Good luck with that recipe. And the bread? Not bad at all. I went to Antioch too but a long time ago…it was then a five year program; I graduated 1960. They are trying to keep it alive but I am not sure they are realistic. I loved the co-op program. My Dad went there too, graduated 1929! Hello! I saw your blog and wanted to mention that Antioch College is NOT closed. The school will be staying open thanks to Alumni who care and who wanted to save the school. You’d make a great food blogger! The one thing great about excellent writers such as yourself, you have the ability to make any topic seem fabulous. I used to Read Stephen Jay Gould for that reason. Other than Gould’s essays, I could really care less about science. I did not like the Pioneer Women blog because there were too many pictures and not enough text. The nice thing about blogs, you can put them together into a book when it’s all said and done. If they don’t quite get the attention you want online, then there’s always the possibility of life offline. Thank you to everyone for letting me know that Antioch will stay open. I had not kept up (obviously) on the state of Antioch, and I am happy to hear that people have rallied to support the college. For me, Antioch holds a special place in my memories. I could write a whole blog just on being a student there. So, congratulations to everyone who made it possible! So I learned something new, which makes me happy. But more importantly, I learned something else: there are actual people reading this blog — and not just the 5 or 6 people I know personally. Whoa..
And one bit of interesting coincidence: Stephen Jay Gould graduated from Antioch (1963). Do you like Anthony Bourdain, from TLC (or is it the Discovery channel?) ‘s show No Reservations? I have a total man crush on him. He wrote a book called Kitchen Confidential (I’m reading it right now) and I think your arrest story would suit the underbelly of anti-glam cooking to a T.
Heck, you might even get your own show. I read parts of Kitchen Confidential in a bookstore once. It just gave me bad flashbacks. So bad, I couldn’t buy it. Working in kitchens showed me how much I do not want to work in restaurants. Although the wine lingo comes in handy at faculty dinners.